The picture above shows a wing that I created using the built-in wing editor that comes with Stallion 3D. The main wing is Selig S1223 airfoils while the remaining two airfoils are a NACA 4512 and a NACA 0012. Since the wing is finite (2 meters in span with a 0.75 m chord), it produces less lift and more drag than is predicted by airfoil (2D) theory. Accurate 3D predictions enables you to size engines/motors, fuel tanks and predict weight, range and endurance even before the vehicle is built. Do you have the power to race with 3 Wings? With more down force, you can corner faster and win races. But what about power vs. drag on the straightaways? Stallion 3D will give you the wing arrangement to win every race. Find out the perfect wing settings to race on hot days, cold ones, wet ones and in windy weather. Designing and analyzing 3D multi-element wings in Stallion 3D is exactly the same as in 3DFoil. 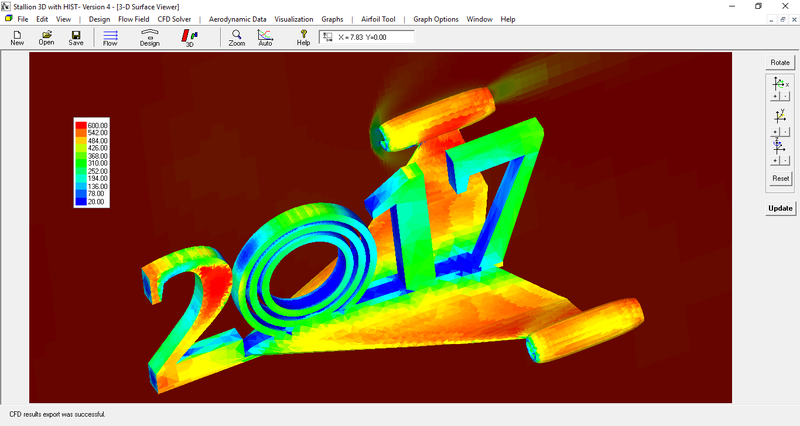 Stallion 3D has the identical wing creation tool that is available in MSA-3DFoil. 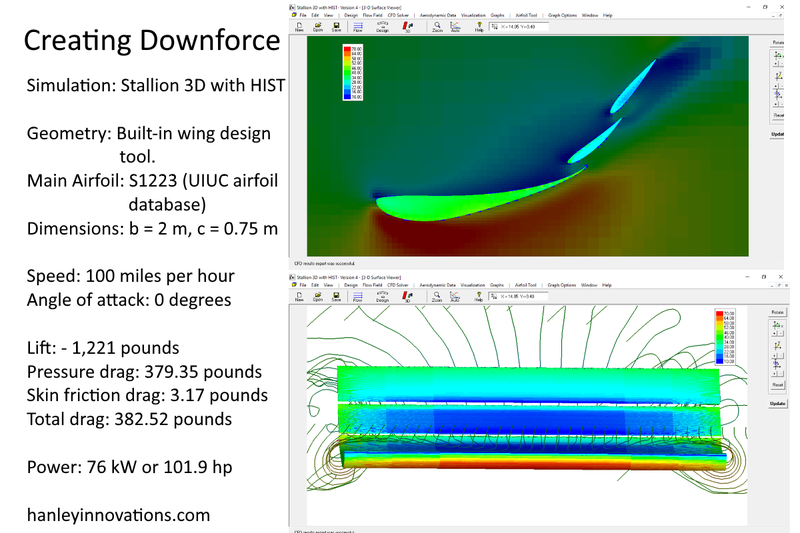 The big difference is that Stallion 3D analyzes the wing using the 3D Reynolds Averaged Navier-Stokes (RANS) equations and this enables you to predict lift, drag and down force for your multi-element designs with variable thickness, rotations and gaps for your race. 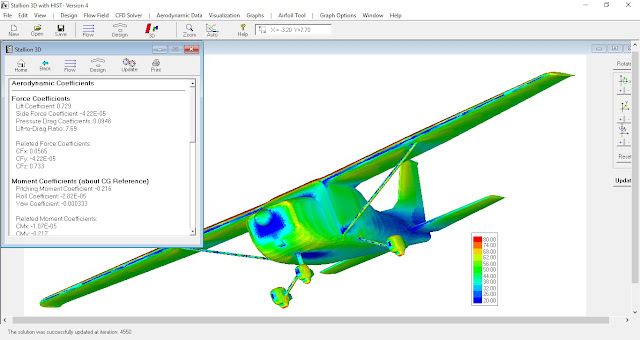 The following video show how to create and analyze a wing using the wing tool and the RANS solver. 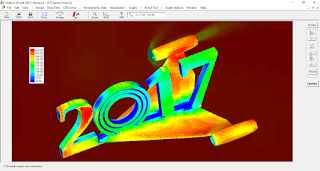 Of course Stallion 3D can also import and analyze a CAD file in STL format created in any CAD software such as AutoCAD or Solidworks. The software performs automatic grid generation directly on your CAD model. It runs on your MS Windows (7,8 or 10) laptop or desktop computer. More information can be found at http://www.hanleyinnovations.com. Thanks for reading. Dr. Patrick Hanley is the owner of Hanley Innovations. He received his Ph.D. degree in fluid dynamics for Massachusetts Institute of Technology (MIT) department of Aeronautics and Astronautics (Course XVI). Dr. Hanley is the author of Stallion 3D, MultiSurface Aerodynamics, MultiElement Airfoils, VisualFoil and the booklet Aerodynamics in Plain English. 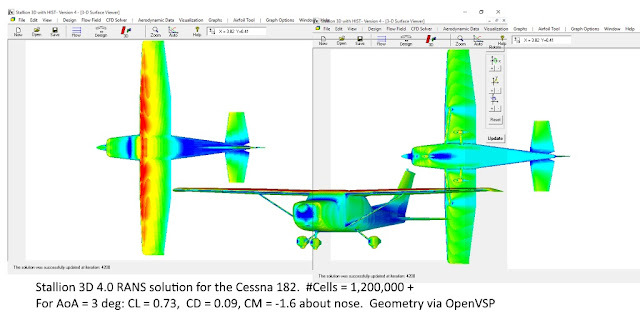 The following tutorial is a step-by-step guide on how to analyze a Cessna 182 using Stallion 3D. The procedure can be applied to any light aircraft design. The analysis starts with a CAD model that is imported into the software. Stallion 3D is unique because the grid generation step is automatic. The software then solves the Reynolds Averaged Navier-Stokes equations to generate the lift, drag and moment coefficients. The procedure can be used to generate a Cl vs. Angle of Attack, Cl vs Cd and power vs. speed charts for your aircraft. 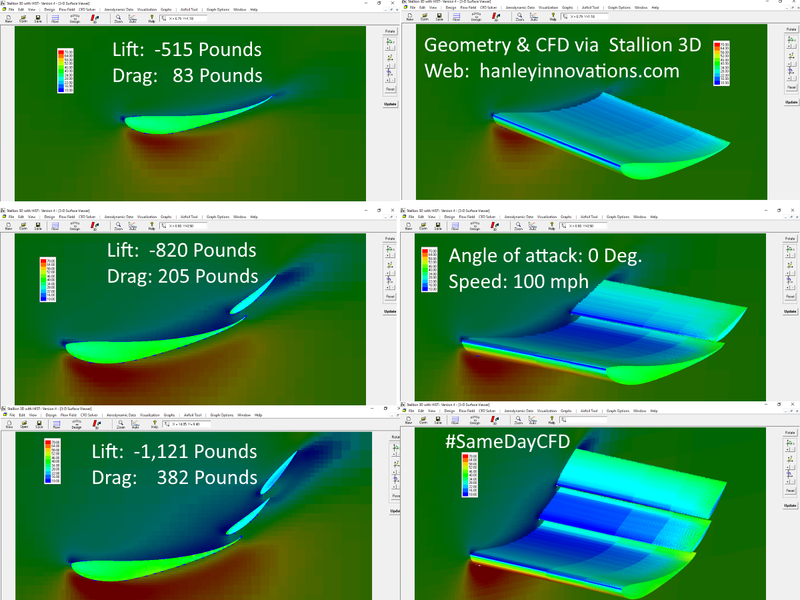 Stallion 3D analyzes the aircraft at any angle of attack and computes lift, pressure drag, friction drag and moments (pitch, roll and yaw about a datum point). I wish you a happy new year and continued success in 2017. The picture above was created from a CAD file on Thingiverse.com (the 2017 model). The wings and engine were added using NASA OpenVSP. The simulation was performed using Stallion 3D version 4.0. The speed is 600 m/s and the angle of attack is 3 degrees. 900,000+ cells were used in the simulation. The Stallion 3D simulation took about 7 hours on a 2 GHz laptop computer running under Windows 10. Do not hesitate to email us at sale@hanleyinnovations.com or call (352) 261-3376 if you have any questions. Thanks for reading - Patrick Hanley, Ph.D.
What's the key to building really fast sailboats? The quick answers is to increase the drive force while reducing the resistance. As with every quick answer, the details are problematic. Fortunately, I developed a very simple computer program that equips marine engineers and designers with accurate information to incorporate into the velocity prediction data. A rapid and proven method to derive the drive force of a sail is to use a vortex lattice method. The analysis requires just seconds on a PC or laptop computer and produces very accurate results. My software, 3DFoil, employs the most accurate implementation of the vortex lattice method and enables designers to model and analyze sails of all shapes and sizes within the program. What about resistance? The program computes resistance on sails and appendages based on size, layout and airfoil shapes. It computes viscous forces due to skin friction and pressure drag. Importantly, it also computes the induced (vortex) drag on sail and appendages during upwind sailing against an apparent wind. 3DFoil is used by world famous marine engineers and designers to compute the drive force, drag resistance, the center of lateral resistance, the center of effort and other parameters that constitute a winning sailboat. It is also excellent for hydrofoil design and analysis. When designing complex products (such as sailboats) we need a quick method to accurately figure out what each of the components are doing. Of course we realize that the components will behave somewhat differently in the aggregate. However, one thing holds true and that is if the component is bad then it will impair the entire design. The lesson that we learn from developing 3DFoil and working with clients is that it does not take long to design & size efficient airfoils, sail, keels, rudders and hydrofoils. It is interactive, fast and filled with shapes that we can print and use in the designs. Do not hesitate to contact me at (352) 261-3376 if you have any questions. Stallion 3D Version 4.0 (New!) represents a leap forward in the area of the conceptual design and the subsequent aerodynamics analysis of wings and other streamlined components. In addition to the capability to analyze the actual geometry of the full sized air frame, the software is equipped with an integrated geometry tool for designing and editing multi-element wings, keels, rudders, struts and other components. 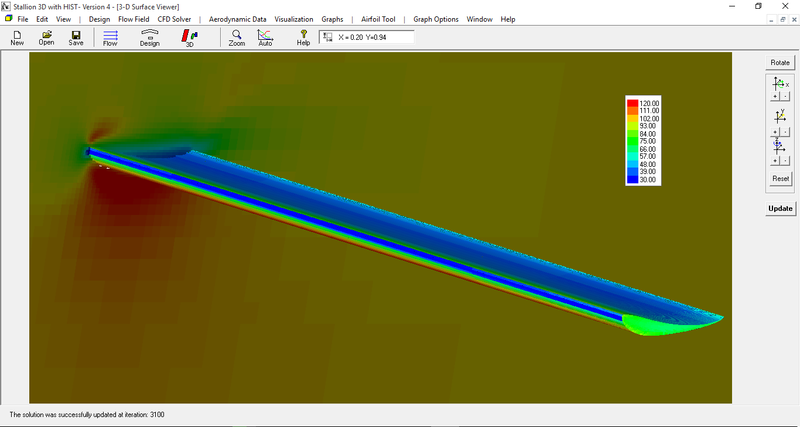 Once these components are designed within Stallion 3D, it is a very simple matter to perform a 3D Reynolds Averaged Navier-Stokes solution on the part such as the rear wing spoiler show in the following picture. Rear wing Spoiler Design (the colors represent pressure). The aerodynamics components are interactively constructed by entering the span, taper (left and right chord lengths), sweep (forward or backwards) and dihedral angles. In addition, airfoils are assignable to the lift and right chords (linear aerodynamic twist). Once the components are designed, the software can then compute the lift, drag, moments and related aerodynamic coefficients. The user enters the airspeed, angle of attack, side slip angle and fluid type (air or water). The setup of the CFD solution takes only a few seconds because Stallion 3D utilizes automatic grid generation as part of the solution process. The following video demonstrates how to use Stallion 3D to design and analyze a rear wing spoiler for a sports car. As the video demonstrates, post processing of the aerodynamics data is also included within the Stallion 3D user interface. Stallion 3D will export all components in the STL format. Stallion 3D v. 4 is available as a 3 months or yearly subscription. Please visit http://www.hanleyinnovations.com/stallion3d.html for more information and to subscribe to Stallion 3D v.4. The following tutorial gives a step by step account on how to analyze a Cessna 182 using Stallion 3D. The procedure can be applied to any light aircraft design. 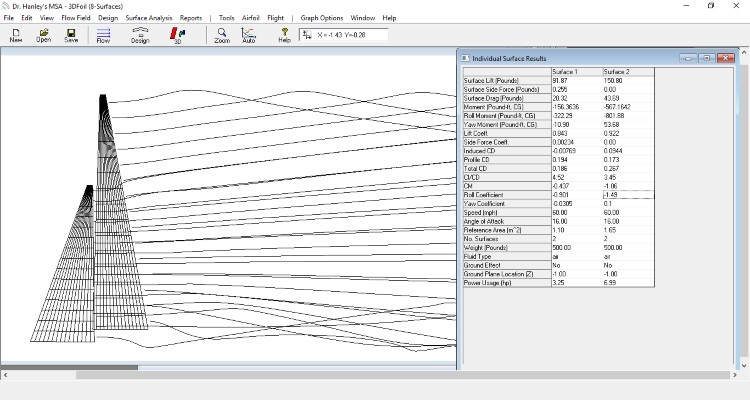 The analysis starts with a CAD model that is imported into the software. Stallion 3D is unique because the grid generation step is automatic. The software then solves the Reynolds Averaged Navier-Stokes equations to generate the lift, drag and moment coefficients. The procedure can be used to generate a Cl vs. Angle of Attack, Cl vs Cd and power vs. speed charts for your aircraft. Thanks for reading. Do not hesitate to contact me if you have any questions.